My previous post on Venezuela claimed media on both sides of the Atlantic to have a long and unbroken record of backing US aggression on the global south. Of scores of examples I might have given, I chose the Observer’s 2003 call for ‘decisive action’ against Iraq. 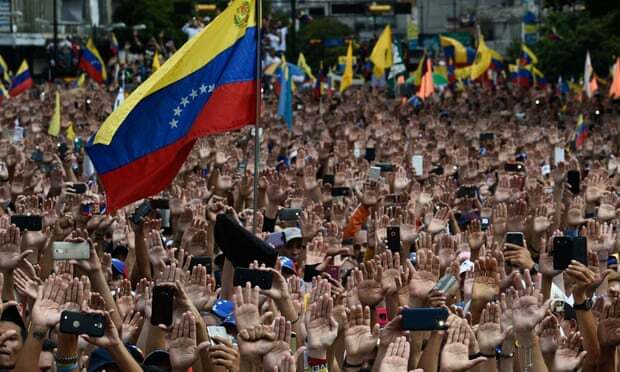 It too has been widely circulated to show mass domestic opposition to Maduro. But, as I point out in my previous post, Murray wisely invites us to look closely at those it depicts. Do they seem ill fed and dressed in rags? Or are these the faces of those who have done very well from their country’s ruthless subordination to El Norte, via domestic comprador classes? The faces, in fact, of those who feel most threatened by the Chavismo project of social justice. The two images exemplify a bigger lie – chain of lies in fact – implied by my claim, in that previous post, that corporate media have “abdicated a core duty in their refusal to explore motives that cast a very different light on Western interventions sold to us as humanitarian”. I might add that, where such abdication provides ideological cover for military assaults of the kind seen in the middle east, those media are parties to what was defined at Nuremberg as “the supreme international crime” of the “initiation or waging of a war of aggression”. Yes, it’s that serious. 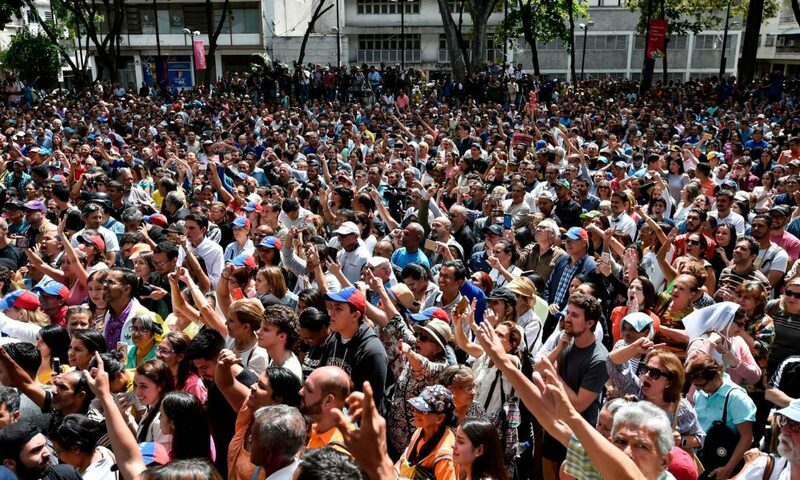 Meanwhile, back in Caracas, would we be quite so sure of Maduro as odious tyrant were we to encounter, on a daily basis, images and footage like this?? Moving on, the Observer editorial tells us in paragraph two that Maduro has “disastrously mismanaged” his country – and in paragraph three that Venuzeula “would be well rid of him” – while cautioning in paragraph four against “US intervention”. Two things about this. First is the mealy-mouthed mendacity of implying that Washington meddling is an imminent possibility, when it is a matter of historic record: on the continent as a whole (plus Central America) and in Venezuela specifically. From murderous and chaos inducing sanctions, to attempted coup on Chavez, El Norte’s inglorious record of installing abysmal regimes to further Wall Street ends is beyond dispute. As is liberal media’s double act of looking the other way, then shedding tears after the fact. The right wing claims the press has a liberal bias, and there’s some truth to that … liberal bias is important in a sophisticated system of propaganda. You don’t express the propaganda: that’s vulgar and easy to penetrate, you just presuppose it. And the presuppositions are instilled not by beating you over the head with them but by making them the foundation of discussion. You don’t accept them, you’re not in the discussion. So when American dissidents criticize the atrocities of some enemy state like Cuba or Vietnam, it’s no secret what the effects of that criticism are going to be: it’s not going to have any effect whatsoever on the Cuban regime, for example, but certainly will help the torturers in Washington and Miami to keep inflicting their campaign of suffering on the Cuban population [i.e. through the US-led embargo]. Well, that is something I do not think a moral person would want to contribute to. Now you, your sceptical tendencies confirmed by the fact you give the likes of me time of day, will follow that embedded link. Others will not, and they outnumber you. Taking as read that the link is to evidence of Maduro’s lack of legitimacy, they’ll pass on the detour and stay with the main article, congratulating themselves at its close on being better informed through their diligence. Later, confronted by ‘Maduro apologists’, they’ll cite his lack of legitimacy as proven. And this – as I’ve commented more than once in the context of Russia, of Syria and of Ukraine – is another staple from the Guardian propaganda toolkit. By repeating unsubstantiated claims, then using them to lend credence to other unsubstantiated claims, our sincere but utterly wrong opinions are daily manufactured. Till we decide we’ve had enough. Re BTL comment, let me single out that currently fashionable phrase, ‘whataboutery’. I’ve written before on ‘a stubbornly empiricist refusal to join the dots; to view each new situation as isolated and without precedent’. This tendency to view Syria as if Iraq and Libya hadn’t happened, Venezuela as if Chile and scores of other US coups hadn’t either, is reinforced by that ‘whataboutery’ response. Offensive and philistine, it gives those who deploy it immunity from any imperative to study patterns. Fence-sitting and having it both ways cascade through liberal media. As Guardian and Observer are vital to Chomsky’s “sophisticated system of propaganda”, so too are house leftists like Owen Jones and George Monbiot vital to the Guardian. Both damn Bashar Assad to Hell and back – and do the same with those experts, from Mother Agnes to Scott Ritter and Ted Postul, critical of Empire-serving claims against him – but preserve their reputations by winding up lamely opposed to military interventions they do so much to give cover to. « Venezuela? The bad guys are on Wall St. I remember 1973 and the coup in Chile and similarly crowds of well dressed folks out on the streets supporting Pinochet and then the horror stories of disappeared and tortured people and thousands fleeing. If we want to replace incompetent politicians taking their country into disastrous economic slump we need not look very far from our own shores! I remember too, Sue. One spin-off being that Sheffield town hosted Chilean refugees – including a few ace soccer players! – who enriched our culture muchly. I don’t for a moment doubt it, bevin. Thank you for focusing on Venezuela. We need to unite together at this time in support of the legitimate democratically elected President Maduro. See this link for further reliable information, supported by academics who dig below the surface. Thanks for the link, Jeni. Dashing out now for walk with a mutual pal, but I’ll check out later today. Thanks Stav. I’m always interested when Graun runs a left cover piece. Especially when, as with this and coverage of last April’s missile strikes on Syria, it can be folded into another attack on Trump – with the clear implication such nonsense doesn’t happen under ‘responsible’ Democrat administrations. Tell that to Libya and Honduras!